Larry Cohen is a legend. When you hear the name as a genre fan, you usually think of such classics as Q, The Winged Serpent, It's Alive, God Told Me To, and The Stuff. Now, through Steve Mitchell's fun documentary King Cohen, you may learn a lot more about this legendary writer/director/producer. 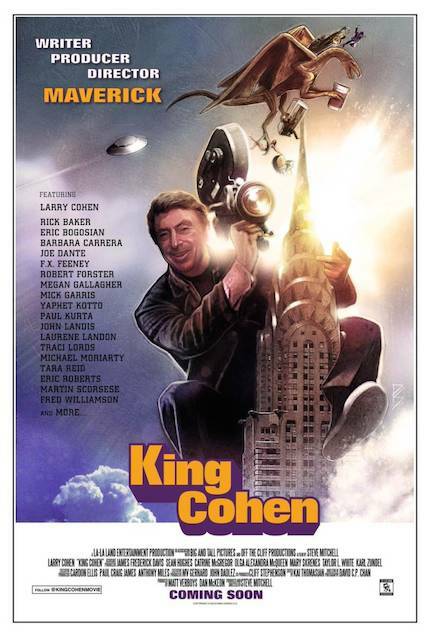 Hot off the Fantasia world premiere, Fantastic Fest hosts the U.S. premiere of King Cohen on Friday September 22 at 5:45pm, with Cohen himself in attendance. (An encore screening will play on Monday, September 25 at 11:30 am.) I was able to speak to Cohen and learned a great deal about making indie films. Read on and catch the film at Fantastic Fest or a festival near you. You can check out the trailer to this entertaining doc below, after the interview. ScreenAnarchy: BLACK CAESAR, Q, THE WINGED SERPENT. THE STUFF. GOD TOLD ME TO. IT'S ALIVE. And those incredible films are only part of your storied career. We’ve learned so much about you in KING COHEN that we may not have otherwise. Is there anything that possibly left out or was cut? Larry Cohen: There were a lot of things left out, but I don’t want to criticize. There’s so much to cover that you can’t cover everything. There were certain things I would have liked to have seen, but as far as I’m concerned, they did a very nice job. It’s hard to get in what you want to cover, especially when your subject has done so much in their career as I have as a writer/director in film and television. While at Fantasia, how did you feel about seeing your longtime collaborator Michael Moriarty again and receiving a Lifetime Achievement Award? I couldn’t refuse it — after all, they were giving it to me. What could I do? I don’t think I should have a Lifetime Achievement Award until I’m finished making movies — and I’m not finished yet. I have it on the mantle, it’s very nice. With Michael, it was wonderful to see him again, bantering back and forth; the audience liked it, too. Many directors have that one actor they work with again and again. What is it about Michael that keeps you coming back? Well, he’s certainly one of the best actors that there is. When you come across someone so fantastic — he’s won three Emmy Awards, three Golden Globe Awards, a Tony for Broadway, and just about every award except for the Oscar — how many people are like that? He’s a very fine actor. I’m so pleased we got along so well and we had so much fun making these movies. We enjoyed ourselves. Onstage in Montreal, you were egging him on to come work with you again — has he acquiesced? Oh no, we’re just kidding around. I think he wants to be retired. He writes symphonies, and he’s very musical. He’d always wanted to do music and said that the acting was only there to make a living. At this stage of his life, he can, so God bless him. We did have fun onstage — that gives you a small idea of the fun we had on set. KING COHEN had its world premiere at Fantasia, its European premiere at FrightFest, and now its U.S. premiere at Fantastic Fest. Where does the film screen next? It’s going to Sitges, Portugal, Paris, and all over the world. I’m here at Fantastic Fest, but I can’t go to the others, I gotta work. I’d give my life away to do all these trips. Was the world premiere at Fantasia the first time you’d seen the final cut, and how did you feel about it? Yes. I was confused by it all. You see stuff juxtaposed from certain things in your life, and it wasn’t exactly the way I remembered it. You have to get used to and adjust your reality to the reality of the people who made the documentary. I didn’t interfere in any way — I let them make what they wanted to make, because when I make my own movies, I’m in complete control of them. If I were to get involved in the documentary, I’d be chasing over the whole project. I didn’t want to do that. I did interviews and called my friends and told them to cooperate. They say when you’re drowning, you see your whole life flash before you. That’s what it was like. Q, THE WINGED SERPENT. THE STUFF. GOD TOLD ME TO. IT'S ALIVE. BONE. Those movies are a lot of fun, but they all have something to say. If you were to make a new movie, starting today, what would it be? Would it be based on current politics? I wouldn’t make a picture to parrot what’s going on in the world, on CNN or Fox News. There’s so much politicizing of everything all day long, that there’s no news. If I want to find out what’s going on, I have to turn on BBC. If I watch American news stations, there’s nothing on but Donald Trump day and night. Enough of it! If I were making a movie, it certainly wouldn’t be about that — I’ve had enough of it up to my ears. The only news on that’s accurate is the weather and that’s not often true, either. Everything else is innuendo and rumors. It’s very tiresome. Now we’re worried about going to war with North Korea, and that’s nonsense. Every week, it’s something new. I did write a script about Charles Lindbergh, who was a hero and then became the most hated man in America when he became a fascist and Nazi sympathizer. With what’s been going on here now, it’d be an interesting picture to make with the ultra-right. How can someone go from being the most beloved person to the most hated person? It’s an interesting journey, and of course, a difficult picture to make, because it’s period — but that’s the script I’d like to make. Are there any projects on the horizon you can discuss? I don’t like to discuss what I’m working on, because then you see that someone else has started making the same movie. I don’t like to reveal my secrets. With the Internet, you can say something, and then within 24 hours, it’s all over the world, China, India, wherever. You can be pirated. That’s the reason I don’t make my independent movies anymore. We did one in Canada. I didn’t direct it, but I sold the script. By the time we finished it, it was on the Internet — it was stolen. The whole company filed bankruptcy and went out of business. To work for months on a picture, to spend hundreds of thousands — maybe millions on something — and then have it stolen so easily… Someone can slip a disc into their pocket, walk out of the editing room, and there goes your movie. It’s just too dangerous. Before when I made movies, it was much harder to pirate a picture. You’d have to steal a print and duplicate it. Making films has become a very hazardous occupation. That’s heartbreaking. What was the name of the film? It’s called Messages Deleted. You might find it somewhere. It’s not very good, but I felt sorry for the producers, because they lost everything. When I made my movies — I made 20 of them — I had buyers before we started production. I never ran around trying to sell them afterwards, because everyone knows you’re very vulnerable with all this money laid out. So many movies don’t get paid for — they take your movie, put up for the advertising and prints, and you never get a penny. Your movie is basically being stolen. I couldn’t do that. Today, it’s the same way; I wouldn’t make a picture unless there was somebody else picking up the cost of the film. But I can’t guarantee to these people that the movie won’t be stolen and put on the Internet. There’s too much jeopardy. I sell scripts now and they make the picture. Whatever happens, its their problem not mine. I’m not in charge of it — I’m just in charge of cashing the check. Of course, when you made those films, you were able to get away with an incredible amount of guerilla filmmaking, which is more or less not possible today. Would you try to attempt that today if you were still making films? No, I wouldn’t. There’s too much security. Big cities have cameras on every corner and we’re so worried about terrorists. If people saw weapons being flashed around or people running down the street with guns, there could very easily be a tragedy. I wouldn’t be firing machine guns off the top of skyscrapers or into the middle of the St. Patrick’s Day parade, or huge melee at the airport. This was all lunatic behavior; we got away with it because there wasn’t this level of security. When I got back from Canada, I had to show my passport six times to get into the United States and had my picture taken by a machine. Things are very tight now. If I was going to climb above Times Square with a rifle like we did in one movie, I probably would be shot down by a police helicopter patrol. I was born at the right time and made my movies at the right time. I don’t think you could do that anymore. Was there ever a studio-level film you wanted to make with a corresponding big budget? This could have been a book you always wanted to adapt or a remake where budget was never a concern. Oh well, when you have a huge budget, everything else goes with it in terms of constant supervision, interference from all sides, people looking at your dailies and criticizing them, telling you who you can cast and who you can’t… these are the things that come with a large budget. That’s not the kind of work I wanted to do. In my whole life, I’ve never had a regular job or been employed by anybody. I was always a free soul. Once you start doing a big-budget picture, you can’t do what you want to do — you can’t change the script, you can’t change the location, you can’t innovate new sequences. Everything has to be budgeted and approved. It takes time. I was happy doing it the way I did it, and couldn’t do it any other way. I couldn’t function at my optimum if I didn’t have complete control and no interference. Not too many people can get there; I was the writer/director/producer and supervised the editing. There was nobody else on set with any degree of authority. Nobody could approach anyone on set and ask them a question or sufferance but me, if they didn’t like the answer. On big-budget pictures, some of the movies today, they must have 12 producers! Sometimes you see the logos of three or four production companies before a movie starts — then you see the producers — executive producers, co-producers. Look at all these people! I don’t want to deal with anybody. All I want to do is write my script, and go out and direct and produce all by myself. I don’t want anyone around or looking over my shoulder — until I’m finished and I give the movie to them. That’s it. If they don’t like, there’s nothing they can do about it, because they don’t know what I shot. When you have complete control on a number of pictures, you get spoiled and you don’t want to do things the other way. A lot of my movies wouldn’t have gone into profits if they were big-budget pictures. The production and advertising costs would’ve eaten up all the money. I know people who have made very successful, theatrical movies that were hits — and they’ve never gotten a penny. I’ve had seven or eight movies that have gone into profits. That’s a pretty good record. That’s crazy to hear — and disheartening. I have to say, I like your style. Well, people who do big-budget pictures and do well at it, can go on to make more and eventually make a salary at it. You used to be able to get a big salary up front, but even with that big salary, there comes a degree of supervision. Somebody’s always on your back, second-guessing you. And then of course, there are the actors. You get these actors who have to exert their power. If there are many producers, these actors can play one against the other. They’re like children, playing Mom against Dad, you know. Anytime they can get in there and cause some kind of dissension, they’ll do it because they can’t help themselves. With my pictures, there was nobody to appeal to; I was the whole cheese. How did you deal with that situation if it came up? There never was any situation. I fired a lot of actors the first day, and they always came back apologizing. They went to work and never bothered me again for the whole shoot. They did what they were told and thanked me “very much” for directing them. Sometimes they gave me a big kiss at the end of every day, the guys as well as the girls. Everybody was appreciated and learned the first day who’s the captain of the ship. That’s hard to do on a studio picture. There are all the producers and then all the studio executives, sometimes six to ten of them. And memos coming down that you have to deal with that are just asinine. I don’t want to live in that world. If someone came to you today from a studio to direct a film, what would you do? First of all, they’re not going to do it. I’d tell them I’d want complete control over the picture and don’t want anyone coming around. In that case, they’d say forget about it, because that’s the way it is. It’s too late in my life to change — and I don’t want to make a picture that takes a year to make. I like making a movie that shoots in 28 days. I’m sick of everybody after 28 days, I want them all to go home. I never got overwhelmed, I just enjoyed it. I was glad when it was over because I didn’t like to get up so early in the morning. Even though my crews were on the smaller side and the actors were helpful, I was still glad to get rid of everybody. I certainly enjoyed doing Q, and dragging everyone up to the top of the Chrysler Building. You could feel it swaying back and forth in the wind. That was fun to do because it was so daring. One of the most daring films I made was The Private Files of J. Edgar Hoover. At that point, he was only dead for two years. The FBI had been very instrumental in blacklisting a lot of people in Hollywood and terrified the motion picture industry. They could easily have destroyed my career — and my life — had they wanted to. To do something not complimentary to the FBI — no one had done that before. Usually, you’d have to have something approved by the FBI ahead of time and have an FBI guy on set. I ended up shooting there, too! I managed to get FBI locales and shoot at the training academy at Quantico and shoot at the FBI — in Hoover’s old office! His home and everything! I got everything I wanted without having to give them supervision of the picture. No repercussion occurred. I took the change and I think I made a pretty good picture. I loved working with all those old actors — Jose Ferrer, Broderick Crawford, Michael Parks, Celeste Holm… people who were icons in the industry. Even the people in it who weren’t Oscar winners were Oscar nominees. Wow. So how did you get those locations? It wasn’t easy getting locations. After they found out what the picture was about, the locations would fall through. But Dan Dailey was in the picture and he’d been in films with people like Betty Grable and Marilyn Monroe. He danced with Gene Kelley and performed with Ethel Merman. Betty Ford, the president’s wife, was a former dancer. She found out we were in town shooting and she was a big fan of Dan Dailey. She called us out and asked if Dan Dailey and Broderick Crawford could come to the White House for lunch! I sent them off and started calling everyone at the locations, saying, “we want to shoot there, but can’t and two of our stars are off having lunch with the President tomorrow at the White House.” They’d put me on hold and come back, then ask, “what time do you want to come?” We got all our locations because two stars had lunch with President and First Lady Ford, Secretary of State Kissinger, and Vice President Rockefeller. That made the picture possible. Once again, fortune smiled upon me. Thank God for Betty Ford! What advice would to give to independent filmmakers working today? I don’t know what to tell anybody. Everything works out differently and there’s no one solution to everything. The only thing I can say is keep trying. You’re always going to get rejected, turned down, and get negative responses. If you give up, that’s the end of it. The only people who persevere are the ones who have the most resilience. They get up off the floor, brush themselves off, and get to the next mission or meeting. Keep trying and don’t give up, because the next person will go ahead and make the picture with you if you keep at it long enough. But I think that 90 percent of people give up. You can’t allow that to happen. The only I was successful at making movies is because it’s the only thing I know how to do. If I didn’t know how to make movies, I don’t know what I would have done with my life. I would have been lousy doing anything else.